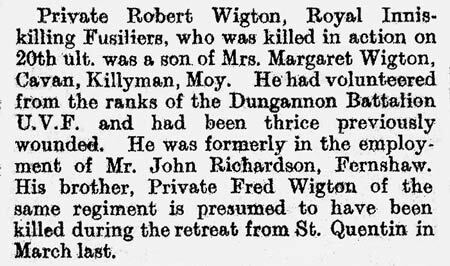 Robert Wigton was the son of William and Margaret Wigton, of Cavan Hill, Killyman, Moy, Co. Tyrone. He was born about 1896 in Killyman, County Tyrone. The 1911 census shows Robert and his sister Ellen working as servants for John Richardson and his sister in Bernagh, Killyman, County Tyrone. Robert Wigton enlisted in Dungannon. Private Robert Wigton (11227) was serving with the 9th Battalion of the Royal Inniskilling Fusiliers when he was killed in action in Belgium on 20th October 1918, age 22. He died 6 months after his brother Frederick. Private Wigton is buried in Harlebeke New British Cemetery, Belgium.. Harlebeke village was taken on the night of 19-20 October 1918 by the 9th (Scottish) Division. Robert Wigton was the second youngest son of William and Margaret Wigton. William Wigton married ‘Harriet’ Powell on 25th January 1884 in the district of Dungannon. Robert was born on 8th August 1895 at Cavan Hill, Killyman, Moy, County Tyrone. He was one of six children. The 1901 census records Robert as a 5 years old scholar. The family were living in Cavan, Bernagh, Killyman, County Tyrone. Family: William Wigton, Margaret ‘Harriet’ Wigton, Frederick Wigton (born 18th May 1885), Sarah Wigton (born 3rd June 1887), Ellen Wigton (born 14th October 1889), William Wigton (born 18th January 1893), Robert Wigton (born 8th August 1895), Andrew Wigton (born 16th April 1900). The 1911 census shows Robert and his sister Ellen working as servants for John Richardson and his sister in Bernagh, Killyman, County Tyrone. Robert Wigton enlisted in Dungannon. Another member of the Tyrone Volunteers in the person of Private William Wigton is reported wounded. He is the younger son of the late Mr William Wigton, Cavan, Killyman, Dungannon. Private Robert Wigton, Royal Inniskilling Fusiliers, who has been wounded in action, is a son of the late Mr William Wigton, Cavan, Killyman, Dungannon, and was in the employment of Mr John Richardson, Fernshaw, Dungannon. His elder brother, Private Fred Wigton, is a member of the 12th (Reserve) Battalion of the Inniskilling Fusiliers. Mrs Fred Wigton, Cavan, Dungannon, has received intimation that her brother-in-law, Private Robert Wigton, Inniskilling Fusiliers, is in hospital in Leicester, suffering from bullet wounds to the thigh. 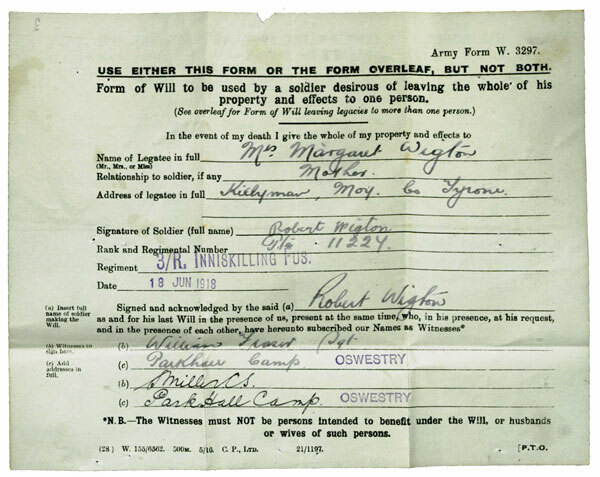 Mrs Wigton, Cavan, Killyman, has received intimation that her son, Private Robert Wigton, Royal Inniskilling Fusiliers, is in hospital in Leicester, England, suffering from bullet wounds in the thigh received during the recent advance. 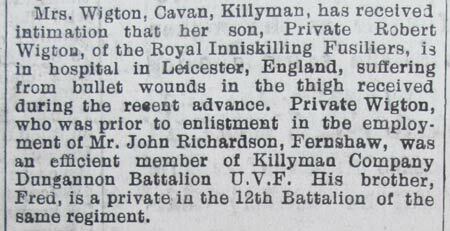 Private Wigton, who was prior to enlistment in the employment of Mr John Richardson, Fernshaw, was an efficient member of Killyman Company Dungannon Battalion U.V.F. His brother, Fred, is a private in the 12th Battalion of the same regiment. The following men of the Inniskillings from Dungannon district are reported wounded:- Private Thomas Orr, son of Mr A Orr senior, Moygashel; Private Robert Wigton, Cavan, Killyman, Private Samuel Stafford, Broughadoey, Moy; Private William Nixon, Royal Irish Fusiliers, Perry Street, Dungannon (late Inniskilling Dragoon); Private G Hodgett, Royal Inniskilling Fusiliers. Private Robert Wigton (11227) was serving with the 9th Battalion of the Royal Inniskilling Fusiliers when he was killed in action in Belgium on 20th October 1918, age 22. He died 6 months after his brother Frederick. Private Robert Wigton, Royal Inniskilling Fusiliers, who was killed in action on 20th October, was a son of Mrs Margaret Wigton, Cavan, Moy. He had volunteered from the ranks of the Dungannon Battalion U.V.F. and had been thrice previously wounded. 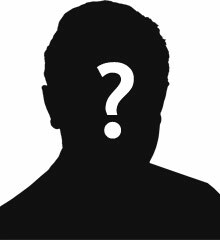 He was formerly in the employment of Mr John Richardson, Fernshaw. His brother, Private Fred Wigton of the same regiment is presumed to have been killed during the retreat from St Quentin in March last. 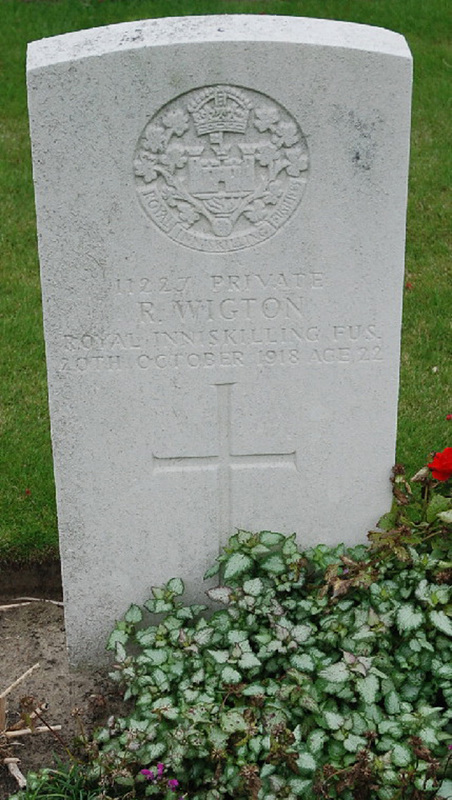 Private Wigton is buried in Harlebeke New British Cemetery, Belgium. Harlebeke is located 32 kilometres east of Ypres. Harlebeke village was taken on the night of 19-20 October 1918 by the 9th (Scottish) Division. The CWGC records Robert Wigton as the son of William and Margaret Wigton, of Cavan Hill, Killyman, Moy, Co. Tyrone. Robert Wigton an older brother who also died in the war. Private Frederick Wigton (27312) was serving with C Company in the 9th Battalion of the Royal Inniskilling Fusiliers when he was killed in action in France & Flanders on 29th March 1918, age 33.